MEDICINE LAKE OUTFITTERS is a wilderness expeditions outfitter specializing in hunting and fishing pack trips into the backcountry of the greater Yellowstone region. Our base of operations is located west of Bozeman Montana along the Gallatin River. During the summer months we guide fly fishing expeditions in Yellowstone Park. From September through November we outfit elk and deer hunts in the mountain ranges to the north and west of the Park. Montana elk hunting is our specialty. Our stock, tack and equipment are all first class. We have a saddle shop here on the ranch where we build and maintain our own tack and pack gear. You will find our staff competent, friendly, and knowledgeable; concerned with your safety and the ultimate success of your hunt. Our goal is to provide you with the finest quality backcountry hunting experience in an atmosphere of relaxed western hospitality. 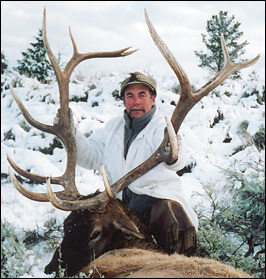 Medicine Lake Outfitters was established in 1974 by Tom Heintz. Tom is a fifth generation Montanan who has spent his entire lifetime serving people in the wilderness travel and recreation realm. Providing outfitting and guiding services has been his sole, full time occupation for the past forty five years.